Having tasted some lovely wines from the 1999 vintage and finding many of the 2000s to be exceptionally tannic, I was curious to assemble a set of wines from good estates and to compare both vintages. With all the wine writers singing the praises of the 2000 vintage as a monumental year, I wanted to see if I actually preferred those to the 1999s. 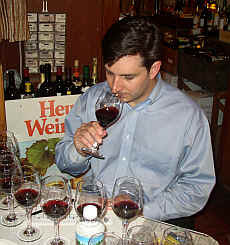 Many casual consumers sit on the sidelines until they are coerced by the beating of the drums by various segments of the wine world to make a purchase. Add this unusual interest in a vintage and the prices of wines can sky-rocket as various eno-scribes work their calculators over-time to add up the scores. As a result, the pricing of wines for the 2000 vintage is about twice or thrice the cost of the lovely 1999s. 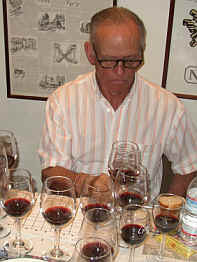 The Wine Spectator's James Suckling pegs the 1999 vintage as rating an 83 point score as a vintage, while the 2000 vintage merits, in his eyes, a glowing 99 point score on the mythical Wine Spectator One Hundred Point Scale. Given the disparity in Mr. Suckling's vintage assessments, we should have seen the 2000s stomp the 1999s. But it turned out to be a rather split decision. The tasting was a delight! Only one wine was flawed, and that due to a "corked" bottle, not bad winemaking. A corked bottle marred this wine's entry into this Bordeaux derby, yet not everyone ranked it last! 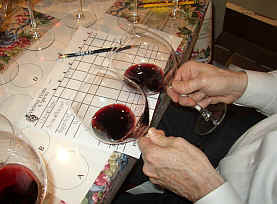 In fact, three tasters looked beyond the obvious corky, musty quality of the wine and ranked the Ducru in second place! One fan characterized this as "a great wine!" but someone else disagreed, saying it's "distasteful, tart and needs time." Another critic took offense to what they felt was excessive SO2, while someone else found Brettanomyces (leathery, meaty notes). 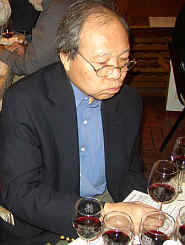 One person detected "coffee grounds notes, bitter plum skins, flint and chocolate" notes in this wine. Another taster liked its complexity on the palate, while someone else found "herbal and olive notes, some blackberry fruit and a silky texture with a hint of white pepper." One fan said it is "unctuous with olive notes and some smoky tones, vanillin and espresso-like flavors." 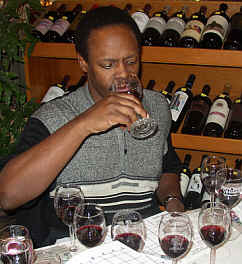 A final critic was not happy with the "SO2, charcoal notes and it doesn't have enough fruit." I found a nice nose showing spice tones, especially nutmeg. Some woodsy elements add complexity to the bouquet. I found it to be quite good on the nose. In the mouth there's plenty of dark fruit, with a mild mocha quality along with cedar and woodsy tones. I gave it a two star rating on my three star scale, no stars being standard or ordinary. This can go another 10-20 years, if you like. One person felt this wine was "aggressively herbaceous," while another suggested it displays "green pepper/Merlot notes." One fan said it offers the "best palate, being full, rich, ripe and complex." Someone else found "herbal and meaty notes, while being sharp and unripe on the nose and having a watery, unfocussed finish." Another critic found it to be "earthy and funky on the nose, with hints of black licorice, currants and tobacco, with a tart berry and herb finish." Another taster felt it was bitter "but got better as it sat in the glass." I detected really lovely sweet berry fruit here with lots of vanillin. There's a hint of an olive tone on the nose, but, overall, it's quite charming. The palate displays dark fruits and I felt it was fairly youthful and sturdy. It can go 10-20 years. One-and-a-half stars+. "This is a muscular, yet refined wine showing black plum fruit, tobacco, vanilla cream and it features a long, lingering finish." said the lead-off batter. Another person found "wet earth, sweet vanillin, some cherry fruit and rich, ripe blackberries with a coffee, toffee finish." Someone else found it "forward," while another critic detected "light cherry fruit...approachable...hint of mint, simple and showing bright cherry fruit." I found some mildly herbal notes and red berry fruit here. It's nice, with a hint of brown spices. There's plenty of tannin here to go a decade or two, with some olive notes and dark fruit tones. One-and-a-half stars. One person characterized this as a "bully." Another correctly identified it as being "very Bordeaux-like." One panel member said it's "dark & brooding, with a barnyardy note, a touch of grilled meat with some plum-like fruit and a tart and tannic finish." Another taster found "dusty notes and red licorice, with a touch of ginger ale. There's a silky texture but it gets leafy and bitter on the finish with some bitter orange peel notes and black licorice." One taster said it's "a serious wine for an off year like 1999," while another person felt it was a "2000 vintage given its huge, dusty tannins." I enjoyed the deep, dark fruit notes here, finding a plum-like quality, along with cocoa and cedar notes. It's fairly tannic and astringent, with plenty of dark fruits and a mouth-drying quality. It needs ten years, maybe 20. One-and-a-half to two stars. One taster felt this had notes of "black tar and over-ripe fruit." Another critic said it is "tart and has a strange taste." A third person found it "tartly acidic, with some grainy notes and under-ripe fruit. A fourth person found "crystallized berry notes and it's tannic, dry and tart." Someone else found "notes of limestone, with a chalky quality and a nice, long finish." A fan said it's "the best wine of the tasting with crushed ripened plum fruit and sweet oak and vanillin tones." 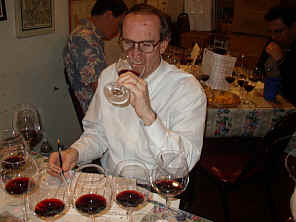 I described the nose as showing hints of pencil lead and woodsy scents, with a cedary quality in there, as well. Nice and balanced on the palate. Elegant, this shows cedar and some dark fruit flavors. Very fine. Nicely done. Ten years' cellaring. Two stars. One critic said this was "very herbal, with tomato stem notes and it's shrill and astringent." Another person found some "raspberry fruit, but it dropped off." A third panel member said it's showing notes of "coffee, with some bitter coffee bean flavors, boysenberry fruit and mouth-puckering tannins on the finish." One critic noted "burnt rubber," while someone else found "caramel and cooked chocolate with lightly vegetal tones." Another person found "coffee, tobacco and good depth. It's an old-fashioned, complex Bordeaux." A final critic detected a note of "burnt coffee." I found this to be mildly meaty and showing a wonderful sweet oak bouquet. There are notes of cedar and vanilla and a whiff of an olive fragrance here, too. Despite a fair bit of astringency, the wine seems to have enough fruit to carry it the distance. Perhaps 5-15 years would be appropriate here. Very fine. Two-and-a-half stars. "Big, dark currants and berries here...somewhat reminiscent of Malbec. Complex and elegant with good fruit/tannin integration." said our first critic. Another person found "dried plum notes, tart berries and orange peel, with a hint of green tomatoes and a tart & weird finish." Someone else said it's "soft and forward and less cellar-worthy than the other wines." But another person found it to have "good structure for aging. It's more a 'world wine' than Bordeaux." A final taster found "tobacco and spice notes with leather, blackberry and mocha." I found plenty of dark plum fruit and a hint of cassis. It's a youthful, intense Bordeaux. There's a lush or plush quality on the palate with sweetly spiced oak notes. Very fine. Needs 10 to 15 to 20 years. Two stars.